Announcement Free shipping on orders over $125 with coupon code BOHOLOVE. Hi! I'm Marie. I'm glad you've found my shop and me! Here's a little bit about us. I am a Christian, Lover of my Husband, Blessed Mama, and Grandma, Friend Hugger, Cancer Survivor, Passionate Entrepreneur, who tries to count each day as a gift. I design and create unique, timeless, beautiful clothing from sustainable fabrics to help women and children Shine. I provide this service with an addiction to handmade design and the highest quality of customer care and satisfaction, with warmth, friendliness and pride in every piece of clothing I create. I love beautiful, timeless, unique and feminine comfortable clothing and I have a passion for designing and creating just that. Every piece you see is not only designed by me, but sewn by me also. until I make it to THAT life...I really believe part of Shining Christ to others includes being happy, being well put together with my ever present up do, a pair of dangly earings, dressing pretty, being comfortable in my own skin and in my own unique Boho Romantic Fashion with a smile on my lips, joy in my heart, and confidence in my style. I'm a lover of beautiful things that are well made and made to last. Whether I'm making a purchase for myself, or making something for you, my customer, that's my standard. I love Romantic, Boho, Mori, Lagen, Pockets, Ruffles and Layers...Timeless Fashion that is Comfortable, discreet but alluring. I love the Natural feel and Simplicity of Washed Linen, Washed Muslin and Washed Cotton and the look and texture of new and vintage laces. I promise you'll love my clothing at both The Wild Raspberry and at my Children's Clothing Boutique, Ellie Ann & Lucy, where Comfort and Fashion Meet. I offer a 100% guarantee on all of my orders. I am glad to exchange, alter or offer a full refund and I even pay return shipping. I make a great product. And I guarantee it. If you're not happy, neither am I! I hope you have a super day and I hope you shine girl! If you have a minute head over to my other etsy shop, ellieannandlucy.etsy.com, a Handmade and Vintage Children's Boutique. Free shipping on orders over $125 with coupon code BOHOLOVE. 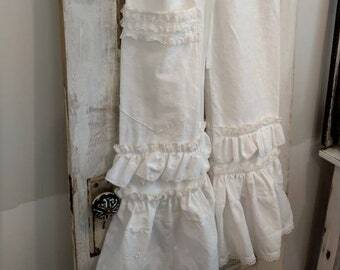 Love these bloomers! They will make my tunics and short dresses look sweet! These are the best pair of pants I have ever bought. The image does not do it justice. Amazing craftsmanship. It has a tie string waist which is my preference and a bit of elastic in the back which I have not seen before but is brilliant! I LOVE, LOVE, LOVE this pants! I will definitely be ordering from her shop again. Recieved my pants. Just love them! Super cute and comfy. Can't wait to wear them in the Texas heat next spring/summer. 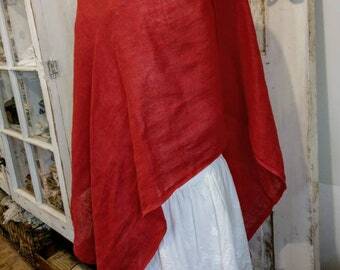 Sewn beautifully and great quality linen. Will be ordering more in future. Here's to you and loving who you are! So. Much. Fabric to create with! Welcome to The Wild Raspberry! I hope you can grab a cuppa and cozy up a bit, while you browse! I finally made the jump and opened up my second Etsy shop, dividing up "The Wild Raspberry" and "Ellie Ann and Lucy". The Wild Raspberry remains a Boho Women's Clothing, with a tink of Cozy Gifts and Home Goods Thrown in, while Ellie Ann and Lucy is my Handmade Boho Children's Clothing and Play and Dream Shop. My dream and the style of these little shops have evolved over the years as I have grown more confident in my likes and what inspires me and brings me peace and happiness. I am a Christian who loves the LORD, a girly girl who loves all things pretty and feminine and all things natural, I love to design and create beautiful, timeless, unique comfy women's clothing, and every now and then to make a few gifts for giving from re~purposed and upcycled treasures or scraps of my leftover linen, into something beautiful, still with vintage farmhouse charm, but with restored and new purpose. I dreamed of an eco friendly handmade shop where I made and sold Romantic, feminine, handmade Boho Women's clothing that is alluring and flattering, yest still oh so comfy,with a unique and vintage flair. 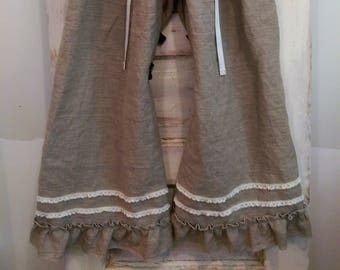 My fabrics of choice are always soft linens, natural cottons, and muslins~ vintage and new, burlap, and new and vintage laces for embellishment on bloomers, skirts, dresses, pinafores, tops aprons and bags. I save all of my natural fabric scraps and use them for stuffing my birds and eggs in my Play and Dream collection, and for stuffing handmade pumpkins in my Home Decor section. It saves money and material, is an all natural stuffing that keeps waste from being thrown away. I also have just a smattering of my small country auction finds with little pieces of industrial goodness, cleaned up and bit, and ready to be re~purposed and re~loved in your home. Along with inspiring handmade signs and vintage framed chalkboards from upcycled barn wood, burlap table ware and all things cottage~farm chic for weddings and garden soirees! My decorating style at home is a mixture of farmhouse meets shabby cottage industrial. I love comfort and I love pretty. When it comes to my sewing and creating, I put my best into all of my handmade items, whether for a wee little punkin,a pair of linen bloomers, or an apron for a momma that wants some kissing in the kitchen. Every garment is designed and sewn from start to finish by me. When I say ALL of my goods are guaranteed, that's what I mean. I desire 100% customer satisfaction. If you are not pleased, you may return your order for a full refund, or a replacement that you have chosen. All of my orders are shipped beautifully wrapped and ready to give. If you would like your order shipped to another address, please specify at checkout. I'm thankful to be here on Etsy. Etsy has provided me with just the opportunity I wanted and needed to live my dream. So here I am doing just that. Actually working in and on my dream, surrounded by Boho Women's Clothing that I've designed myself, my vintage mannequins, bunting, chalk boards, piles of natural old and new fabrics, vintage clothing, burlap, linen and lace, old wooden crates and steamer trunks, blissfully sewing and painting away all from the comfort of my own studio/sewing room nestled in the woods, on this charming little country road in small town Missouri. My number one goal in life is to love who I am while striving to be more like Him. I hope I can shine a little bit of that happiness into your life too! You can find me on Facebook and Pinterest too! Welcome to The Wild Raspberry! I'm so glad you stopped by! Hello friend! Here at The Wild Raspberry, I want my customers to be 100% happy with your order. If your clothing isn't beautiful AND comfortable, please let me know. I will alter, replace or refund your order, whichever is your preference AND pay return shipping. Happy customer. Happy Marie. I accept PayPal, Direct Checkout, Credit Cards, Money Orders and Checks. Orders purchased via Money Order and Checks will be shipped after they have cleared. All Handmade clothing orders are custom made and will be processed and shipped within 5~10 business days Monday-Friday, depending on how busy the shop is. PLEASE note with every international order, additional shipping may apply. Suggestions, requests and feedback are welcome. I would love to hear from you!